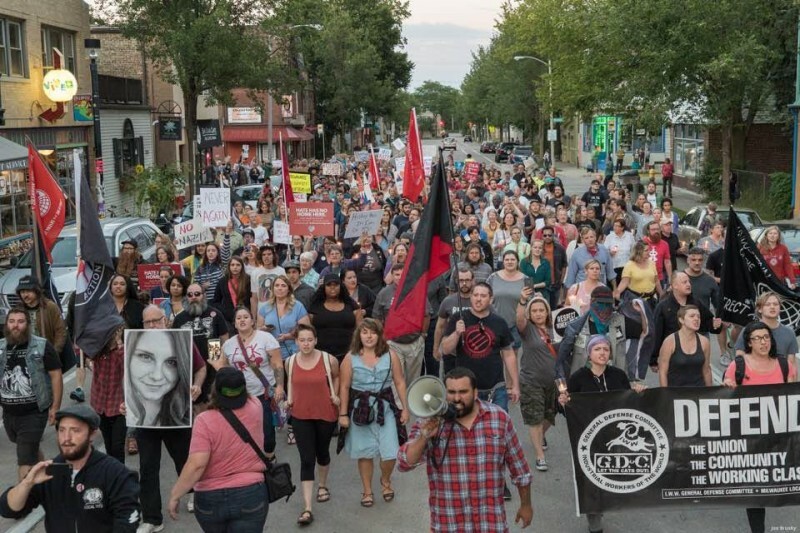 Hundreds march in Milwaukee, stand with Charlottesville | Fight Back! 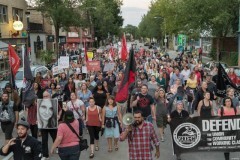 Milwaukee, WI — Over 500 people marched through Milwaukee’s Riverwest neighborhood to stand in solidarity with the wounded protesters in Charlottesville and to remember Heather Heyer, the young woman murdered by a Nazi. The rally was called by the local chapters of the Industrial Workers of the World (IWW) and the Democratic Socialists of America (DSA). The crowd gathered in a park outside the Riverwest Public House, a bar co-op that is the go-to spot for the neighborhood’s left-wing community. Speaker after speaker condemned the violence from the fascists, and called for people to continue to rally against their rise. Many connected this rise to the far-right policies and rhetoric of the Trump administration. Other speakers connected to violence in Charlottesville to Milwaukee’s own history of fascist violence, particularly the murder of six Sikh worshipers by a neo-Nazi five years ago. After the speeches, the rally turned into a march through the surrounding neighborhood. Their spirit was determined and boisterous as the marchers loudly chanted “Whose streets? Our streets!” and “No Trump, no KKK, no fascist USA!” Everywhere you looked, neighbors were leaning out windows and standing in doorways, joining the chants and cheering the marchers on. Two men heckled the marchers, but it only made them chant louder. The march ended back at the park where it started. Many stayed after spending time with each other and discussing the next steps forward.